The aim of this study was to create a job-exposure matrix (JEM) for wet work. 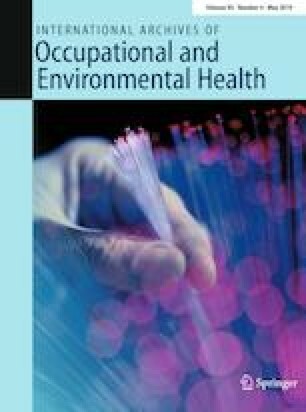 A JEM is a tool used to assess exposure to potential health hazards in occupational epidemiological studies. It can be used when counselling concerning job change/job choice, as a medico-legal tool when recognizing diseases as occupational and when planning interventions regarding prevention of, in this case, occupational hand eczema. The study population was based on results from national surveys on working environment performed by the National Research Centre for the Working Environment in Denmark in 2000, 2005, and 2010 (National Research Centre for the Working Environment). We assessed responses on questions regarding wet hands, glove wear and total wet work. For the JEM a cutoff of 2 h total wet work/day was chosen as the exposure measurement. The proportion of responses of 2 h total wet work/day in each profession is illustrated as a number between 0 and 1 equal to 0–100% of the responses. Total wet work was most frequent among cleaners (domestic, office, and hotel cleaning), butchers and fishmongers, cooks, beauticians (hairdressers, barbers, related work) and health care workers (home-based personal workers, dentists, dental assistants). Regarding differences between sexes we found that indifferent of age and profession, women had 78% higher odds of having wet work. We found that wet work as an exposure varies among professions depending on whether wet hands or glove wear is assessed. A JEM is a useful tool to assess the extent of the exposure, wet work, independent of prior perceptions of classical wet work professions. The online version of this article ( https://doi.org/10.1007/s00420-019-01435-2) contains supplementary material, which is available to authorized users. This study is independent research and funded by The Danish Working Environment Research Fund (Arbejdsmiljøforskningsfonden). The study was approved by the Danish Data Protection Agency (Project Number BFH-2017-094). All methods were carried out in accordance with the relevant guidelines and regulations.